I do not have a problem with Pot, it has medical uses that should desperately be looked at. As far as the harder drugs, absolutely NOT. If so many people want universal health care, this would tax the system into oblivion. Even in our private health care system it would bankrupt the insurance companies, or cause the cost for health care to go up dramatically, in the end causing a world of hurt for responsible people that do not use these drugs. My mom in the past worked in a hospice, I have seen some of these people as they get ready to die, it is NOT pretty nor is it cheap from a money standpoint. These drugs do more than ravage your body, they absolutely and 100% of the time destroy it. The left works so hard to get cigarettes out of the hands of everyone, yet advocates the use of drugs that use common household cleaning chemicals that rot your body from the inside out. Illegal drug dealers, growers, "manufacturers", etc. higher up in the hierarchies, at least, also help support those who are against legalization (although obviously, it's usually not transparent support) because legalization would hurt their livelihood by inviting competition and affecting their profit margins. Do you believe that empirical claims are provable? 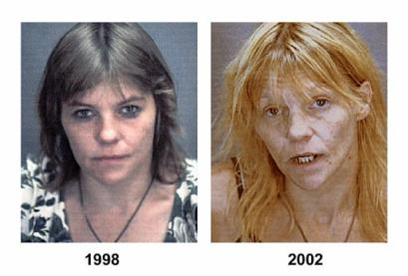 Legalizing drugs is GREAT for America..
you DO realize that this is what happened to this woman and the others you posted regardless of the fact that drugs are illegal? prohibition didnt keep this from happening. you know that, right? i always thought that pictures such as these, as well as the occasional look into the glamorous lives of junkies serves as a great educational tool in keeping young people off of drugs. elvislives, i have noticed a pattern with your opinions on these matters. your entire arguement ignores the fact that all of the negatives of drug abuse occur in spite of them being illegal. your entire logic overlooks the fact that the "war on drugs" is futile. your entire arguement ignores the fact that all of the negatives of drug abuse occur in spite of them being illegal. I'm not sure I'd call copying and pasting--especially not copying and pasting photos, lists of links, etc. an argument. Argument 1: "But taking drugs is an individual's choice...."
Argument 2: "Legalizing Drugs will Mean Less Government." Argument 3: "The Drug War isn't Working..We need to try something else." Argument 4: "Legalizing Drugs Will Reduce Crime.."
Argument 5: "Legalizing Drugs will take the thrill out of Drugs and people won't use them." If you decriminalize theft and murder, you'll reduce crime, too. I'm not remotely religious, but I have to deal with the aftermath of poor decisions and drug use every day. It should not be legal. In fact, the punishments for distribution should be much more severe. LOL thats because you a picture is worth a thousand words and you cannot dispute one single things i have said or shown.